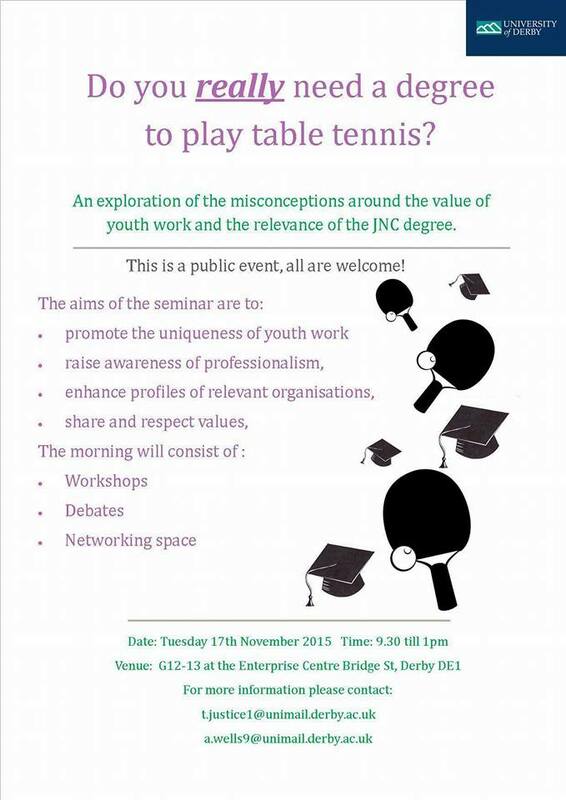 Do you really need a degree to play table tennis? Thanks to Charlotte McGovern, Tracey Justice and Abbey Wells for news of this student-led event at the University of Derby on November 17. We are very much hoping to be involved. Hi again Tony, what does JNC stand for? This looks really cool too. JNC is shorthand for the Joint Negotiating Committee on Youth Workers’ pay and conditions. It’s a specific scale that for a long time local authorities honoured as the appropriate scale for full-time qualified youth workers. However it’s now under severe attack. Indeed it’s misleading to talk of a JNC degree as if this means the graduate will be automatically paid under the JNC. The reality now is that graduates will be paid whatever employers deign to pay. This said JNC salary and conditions, linked traditionally to teachers’ pay, is still a benchmark for the youth work profession.